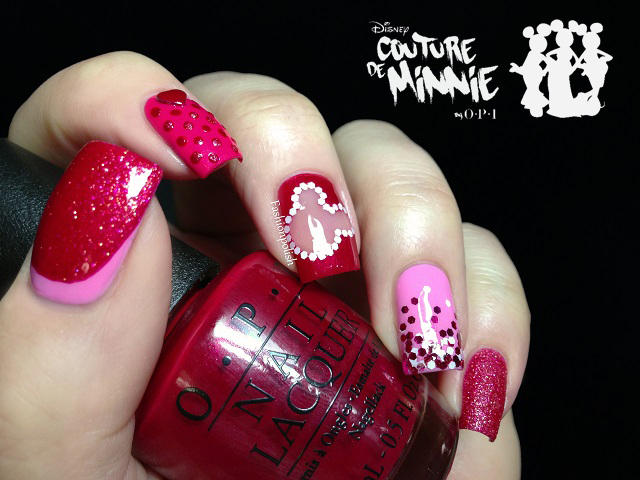 Fashion Polish: Minnie's Closet OPI Minnie Couture Nail Art! 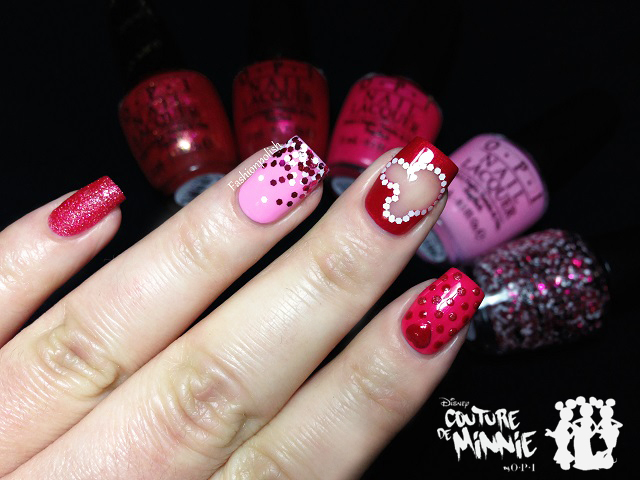 Minnie's Closet OPI Minnie Couture Nail Art! I'm sure you've noticed I've been doing more nail art lately. Well today's manicure is a bit special as I had to keep it a secret until now. I don't know about you but I really hate keeping secrets! it just feels excruciating not being able to tell a soul about something really exciting, don't you think? 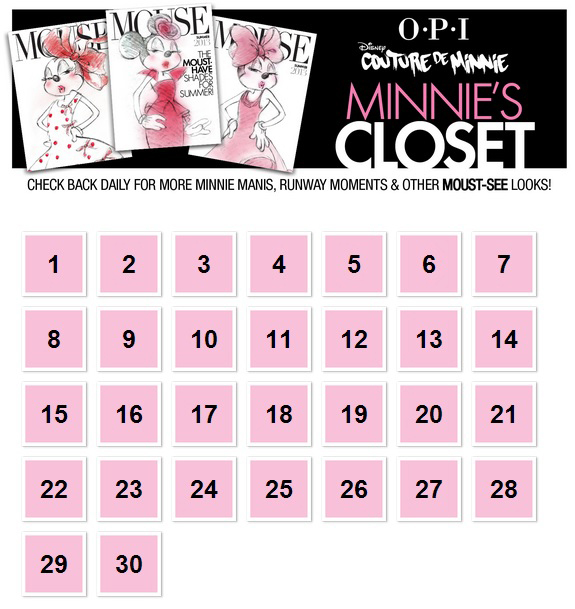 Well anyway... A few weeks ago, OPI asked us to create a nail art inspired by Minnie Couture for their Minnie's Closet gallery. Of course, I jumped on the occasion and today I can finally share it with you! Thumb : I started with two coats of Chic From Ears To Tail, added a Liquid Sand Magazine Cover Mouse ruffian and sealed with topcoat. Index : I used two coats of A Definite Moust-Have, used topcoat to glue a small silver heart shaped stud that I had previously painted with Innie Minnie Mightie Bow and finally dotted the rest of my nail alternating Innie Minnie Mightie and Liquid Sand Magazine Cover Mouse. Middle : This is the nail that I spent the most time on and definitely my fave! I first cut out a Minnie head shape in scotch tape, applied it on my nail, layered one coat of Innie Minnie Mightie Bow on top of the tape and then quickly removed the piece with pointed tweezers. Once that part was done, I put a few drops of Minnie Style over a small sheet of paper, carefully picked white glitters one after to other and placed them on the Minnie shape. Of course, I sealed everything with topcoat as well. Pinkie : Again, a very simple nail but I didn't want to overdo the design so I went for two thin coats of Liquid Sand Magazine Cover Mouse on its own. Well I hope you liked this nail art, if you have any questions, please let me know in the comments! Sam, Sam, Sam! you're killing me with your gorgeous nail art!! I adore the one with Minnie head, that's so cute!! LOVE this!! That heart is adorable and so is the little minnie head!! 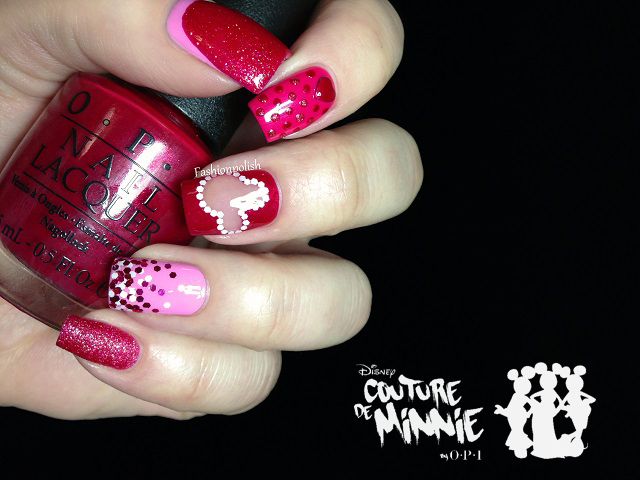 This is the best mani I've seen with these Minnie polishes!! I swear, you have the best swatch pics EVAH!! Wow! Love your design! Gorgeous! I can see why OPI would ask you to do this, this mani is amazing! I can't wait to see what else you come up with! I love when you do nail art! Minnie looks great! Gorgeous! 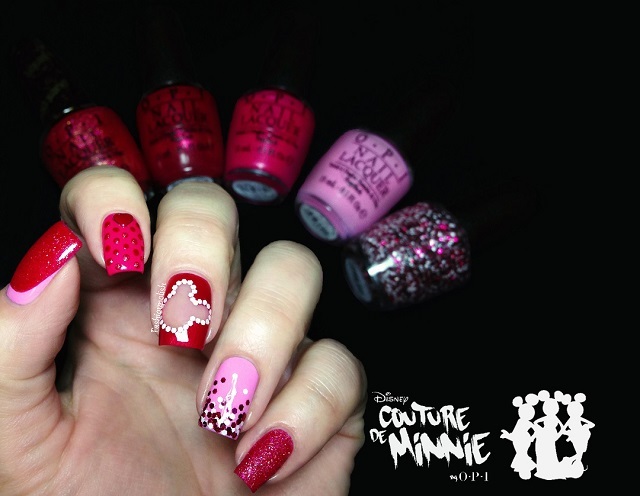 The Minnie outline is just so cute!! I am loving all your nail art, so gorgeous! This Collection is fab! This is one of the most stunning nail art compositions I have ever seen. I love it!! Can you explain the technique for the ruffian manicure? Thanks! wow! You are sooo creative!! Beautiful nail art! Love your middle finger!!! Love the Minnie cut out! Love the middle finger design! So, so cute! woooow. amazing design !!! great work !! !